In the last post we went over one of the hottest new looks for the office, here’s another that will be sure to have you turning heads. The two piece sweater suit is not only unique, but extremely comfortable and forgiving to most body shapes! 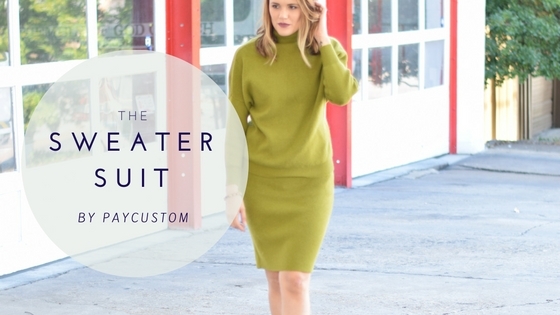 The sweater suit is very forgiving to most body types due to it’s dual fit cut. The bottom skirt is pretty much like a tube dress. It is a super fitted knit that comes all the way up, just under the bust line. The turtleneck top is loose fitting with a cinched bottom to hug the waist. This hides any stubborn tummy fluff while accentuating the hips and legs, making the body look lean. I chose the ostritch dot Chinese Laundry heels to dress up the look. Since the suit is solid, it allows for a little spice in the shoe department. If it is too cold, no worries, booties can also be paired with this look. Accessorizing this outfit is super easy. No necklace or bracelet needed since the sweater covers these areas. I chose a Jessica McClintock acid wash style clutch and geo metal earrings from The Attic to complete the ensemble. Loving this sweater suit? You can snag yours at Metisu Online Shop. I love METISU’s quality, unique garments. I usually shop the site when I am in need of a statement piece for a social event. Be sure to follow them on Facebook (click here) or Instagram (click here).